A health worker marks a boy’s finger with ink to show that he has been vaccinated against measles in India’s Gujarat State. “We have seen a“substantial drop in measles deaths for more than two decades, but now we must strive to reach zero measles cases,” said Jean-Marie Okwo-Bele, Director of the World Health Organization’s (WHO) Department of Immunization, Vaccines and Biologicals, in a joint statement on Thursday for the Measles and Rubella Initiative (MR&I). The study, published by MR&I – a partnership formed in 2001 between the UN Children’s Fund (UNICEF), WHO, UN Foundation, American Red Cross, and US Centers for Disease Control and Prevention – marks the first time that global measles deaths have fallen below 100,000 per year. “Measles elimination will only be reached if measles vaccines reach every child, everywhere,” added Dr. Okwo-Bele. According to the joint statement, people being treated with the first of two vaccine-required doses have stalled at approximately 85 per cent since 2009, far short of the 95 per cent coverage needed to stop the infections, and coverage with the second dose, despite recent increases, was only 64 per cent in 2016. Some 20.8 million children are still missing their first measles vaccine dose – more than half of whom live in six countries. Nigeria has 3.3 million unvaccinated children; India has 2.9 million; Pakistan, two million; Indonesia, 1.2 million; Ethiopia, 0.9 million; and in the Democratic Republic of the Congo, 0.7 million are not immunized. Since measles is a highly contagious viral disease, large outbreaks continue to occur in these and other countries in Europe and North America, putting children at risk of severe health complications, such as pneumonia, diarrhoea, encephalitis, blindness and death. Countries with the greatest number of measles deaths rely most heavily on polio-funded resources. Once polio eradication is achieved, those resources, which support routine immunization services, measles and rubella vaccination campaigns and surveillance will be at high risk of diminishing and disappearing, reversing the progress made. 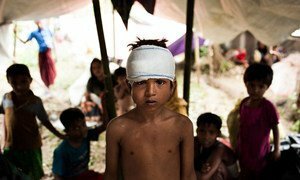 Issuing a dire warning on the desperate situation of Rohingya refugee children, who now number more than 320,000 in Bangladesh, the United Nations Children's Fund (UNICEF) has called for an end to the atrocities targeting civilians in Myanmar's Rakhine state, and immediate and unfettered access to all children affected by the violence there.